I am not going to lie, designing this room for Caroline enabled me to live vicariously through her and create the ultimate fun, bright colored, and coolest sprinkle room ever! When I first discovered sprinkle wall decals on Pinterest, I knew I had to incorporate sprinkles into our oldest daughters room design. When we lived in Gainesville, Fla. our home had three bedrooms, so when we found out we were pregnant with our youngest daughter we decided the girls would share a room in order to preserve the guest bedroom. 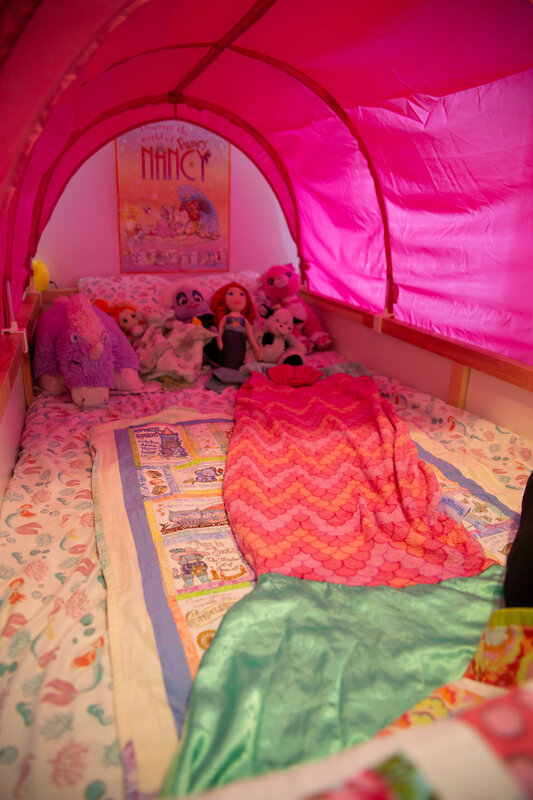 The room was large, but we wanted to find a bed with extra storage or a loft to create more space for the girl's. We looked all over and eventually settled on the IKEA KURA White, Pine Reversible bed. We picked this bed for a few reasons: One, if she ended up scared of sleeping in a loft bed it was reversible and could be easily changed to a normal bed. Two, it was under $300. Since it was new and we wanted the transition to be exciting for Caroline, we made the bed extra cool by adding a pink tent! The search for the right dresser was also a challenge because of the raw wood on the loft bed but we settled with an IKEA dresser with the plan of maybe painting it or changing out the knobs but once we got it in the room it was a perfect fit as is. We used two IKEA mirrors as a vanity over her dresser. They were originally in our room but ended up being perfect for Caroline's new room. Next, to her dresser, we created a gallery wall with all kinds of fun things! Of course, she needed a unicorn for her wall, we found the cutest one at Hobby Lobby and used a few pieces that were in her old room. I ordered a watercolor donut print to tie in with the sprinkle theme. A few years back I made her a holder for her bows and other hair accessories with yarn and an old rocking chair spool. The room would not be the Sprinkle Room without the sprinkle wall! We found the decals on Amazon and they were a great deal ($12.73). My husband installed them and it was way easier than we anticipated. We painted all the other walls a soft pink per Caroline's request and left the sprinkle wall white. On the sprinkle wall sits a fun little reading nook and bookcase. This can also be found on Amazon for just $79.33! To finish off her room we wanted to create space where she could play in her bedroom but not take up too much real estate. We found an awesome wall mounted dollhouse from Ikea and got an adorable cloud light to mount above it. We ordered furniture for it off Amazon that matched her room and she LOVES it. The light makes a great night light for her as well as looks cool over the house. The Sprinkle Room was the talk of the neighborhood amongst all the little girls when we first moved in and if you asked Caroline what she like most about her new house she would always answer by saying "My Sprinkle Room!" Having little girls is so fun and I love decorating their rooms by bringing imaginative colors and decor. I can't wait to share Ella Jaye's room next!